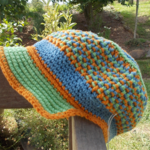 Round, cotton/acrylic washcloth in vibrant turquoise ON SALE!!! Square cotton/acrylic washcloth in orange ON SALE!!! crochet baby shoes "giggle feet" wool, soy, bamboo. 11-12cm foot ON SALE!!!! 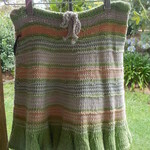 Hand knitted baby rug, for floor, car seat or pram. ON SALE!!!! 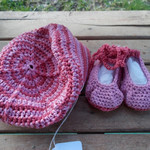 Baby set - beret and "dancing feet" shoes in pink corn silk fibre ON SALE!!!! 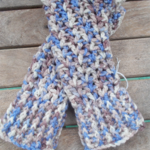 Crocheted fingerless mitts. Black and green in acrylic yarns, size L ON SALE!! 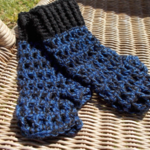 crocheted fingerless mitts. cream, camel and light blue. 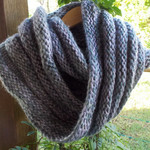 Pure wool ON SALE!!! 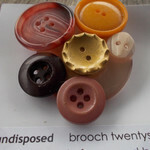 Brooch - undisposed twenty seven. made from vintage buttons ON SALE!! 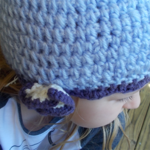 crocheted winter hat with brim. 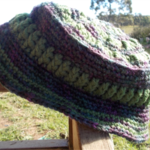 Purple and green ON SALE!!! 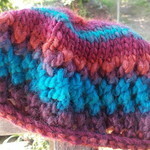 child's knitted beret, wool and soy yarn, multi-coloured ON SALE!! !